Riding on high capacities of industrial ability and understanding, we are providing top class Thermal Coating and Protection. These services are delivered in agreement with the clients’ requisites to achieve client gratification. In addition, we commence these services only after identifying the given details of our clients. Also called as metalizing, this is one technology that offers a long term protection from corrosion we can offer 10 years of guarantee on our services once we do this, no rust for 10 years and if we fail we will do it for free. Thermal sprayed coatings are extremely effective at increasing the component life and value, decreasing equipment / machinery down-time, and improving performance in a wide variety of applications. Thermal Spray Welding is carried out by oxy-acetylene process to increase the life of thermo wells in temperature sensing areas of boilers and reactors, which are subjected to severe abrasion at high temperatures. AC-HVAF/SAF powder spraying equipment is used for the application of coatings from carbide, pure metal and metal alloy powders for the protection of parts, machines, vessels and structures from abrasive wear, erosion and chemical corrosion. In all sectors of industry today, the phrase “better, faster, cheaper is common and valid, as it seems that production demands are ever increasing. Highly demanding requirements and aggressive service conditions often leads to premature loss of functions. 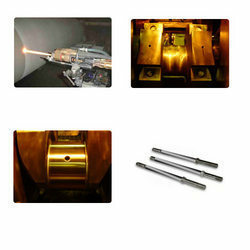 We are associated with world’s leading thermal spray equipments and consumables (all types of powders and rods) manufacturer and supply exceptionally high-quality products at reasonable price. We also provide thermal spray coating services to our valuable customers on the case to case basis. Metatech Thermal Spray Pvt. Ltd. is reknowned Company in the field of HVOF Coating. We provide high Quality Turbine Runner Coating for Erosion Resistance. Turbine Runner Face goes through excessive erosion due to abrasion. For this we provide a high finished coating with provides protection to Turbine Blades. Specification i.e. Shell, KNPC, PDO, DEP for TSA coating. Backed by our rich industrial experience in this domain, we are providing Aluminum Thermal Spray Coating Service.